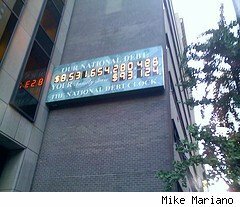 Like the Y2K scare because computers lacked a four digit date, the National Debt Clock in New York City only has 13 digits, but this past week the sign rolled past the $10 trillion mark thanks to Congress’s $700 billion financial bailout plan. The sign’s owner had to replace the dollar sign in front of the number with another digit to keep the sign running. In 1989 Artkraft Strauss, sign company, and real estate developer Seymour Durst put up the National Debt Clock on the Avenue of the Americas in New York City to draw attention to the growing problem. The national debt was only $2.7 trillion dollars that year. The national debt is equivalent to approximately $33,333 for every man, woman, and child in the country. The clock was actually turned off for a couple of years in 2000 when the national debt was shrinking because the clock is unable to run backwards. The clock was not off for long when the our debt started to rise again in 2002. I think this is embarrassing for us as a nation, and it leads me to second-guess a lot of how things are being run overall. The bailout is not a long-term solution for this problem, and there is no insurance that it will make any difference in keeping us on an upswing. The numbers on the counter are more of a symbol of the dysfunction, but they speak volumes.